Can urban resilience cope with earthquakes? Earthquakes are devastating at different levels. They impact the cities, the organizations and the persons. Though short in duration, they may destroy not only infrastructures but our historical heritage too. They talk about an irrational fear: the destruction of our matrix. According to C. Strupp (1), it is estimated that earthquakes caused 2 million deaths during the 20st century. The questioning related to urban resilience and earthquakes refers to the ability of organizations to withstand such hazards without compromising their daily operations. But theories differ greatly on the ability of organizations to learn from such disruptions, and if they do, how and under what circumstances. In an article published in 1996, L. Comfort underlined the complexity of the methodology to assess self-organizing processes in disaster environment due to the number of agents involved in performing too many different functions simultaneously under radically altered conditions (2). Nonetheless, there is no doubt that a city like San Francisco is deeply committed in the preparation, anticipation, adaptation steps in case of a quake (3). The “preparedness maps” published by a number of cities under threat are outstanding. But is there any evidence that the remarkable risk management policies developed by those cities will lead to resilience? A report published by The World Bank (4) highlights the benefits of an interesting tool. Risk modelling can simulate consequences of past centuries natural disasters when they would happen today. But at this stage, it seems difficult to evaluate whether such tool could improve the recovery, or the resilience, of a city hit by a quake. In an extensive and documented paper on Mexico City’s 1985 earthquake (5), one of the most destructive of the past century, Diane E Davis, MIT, underlines the difficultly of assessing the appropriate time frame for a city recovery. In the case of Mexico City, the infrastructure damages were still visible fifteen years after the quake. But what is interesting is to see that the bounce back logic pushed by authorities did not answer the population expectations, particularly among the poorest, willing to regain their “dignity”, while nothing was done in favor of temporary shelters or first emergency care but everything to restore the services that enabled the city economic dynamism. This shows that eventually, a city can recover its infrastructure and economic fundamentals without providing the means for restoring the well-being and well- living any population is aiming at. In such case, speaking of resilience seems inappropriate, at least seen from the point of view of the urban citizen. On the contrary, when citizens decide to refuse the restrictions imposed by an autocratic administration, take charge of their own lives and develop their skills, and this happened precisely in the case of Mexico City, then, as underscored by D.E. Davis, the notion of resilience might be applied as much to the people as to the city itself. 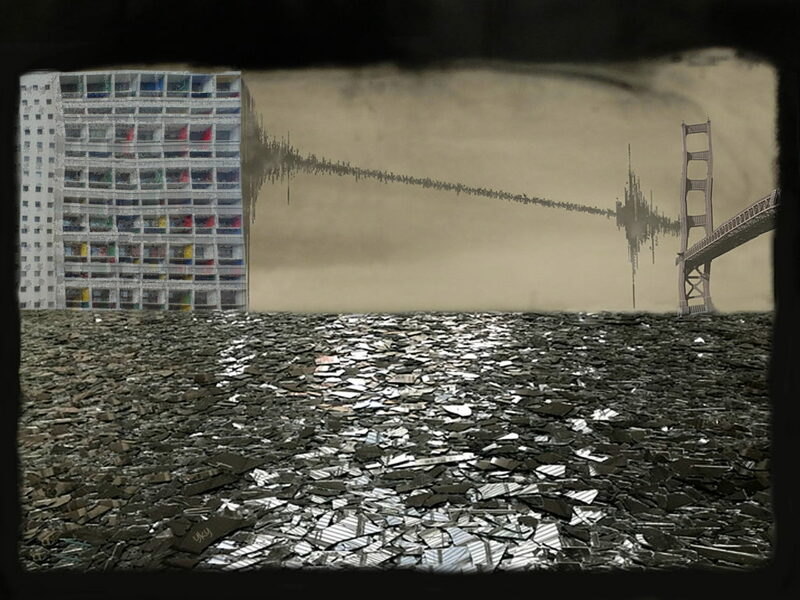 Will cities threaten by seismic hazards learn from the past in general and from Mexico City in particular? How impacting are the development of democracy and the level of citizen’s empowerment? In an ideal world, a resilient city should at least find the means for improvement during the unavoidable aftershocks that no one can ignore. The questioning about vulnerability, at the interface between recovery and resilience led to the below work. The broken glass refers to fears and fragility, while two iconic symbols raise the issue of cities vulnerability.